One of the greatest decisions I have made in my life was to go natural. As I have watched tons of women embrace their natural hair throughout the world, I have always wanted to have more celebrations of natural hair here in my state of North Carolina. I am happy to say that more natural hair meet ups and events are coming to the Carolinas and the one I'm most excited about is the Curls Gone Wild Tour coming to Greensboro in July! Return of the Curls is all about embracing the diversity of beauty. Whether it’s fashion, wellness or hair care for curly textures, we provide a forum for every hue, gender, size and curl to become inspired. 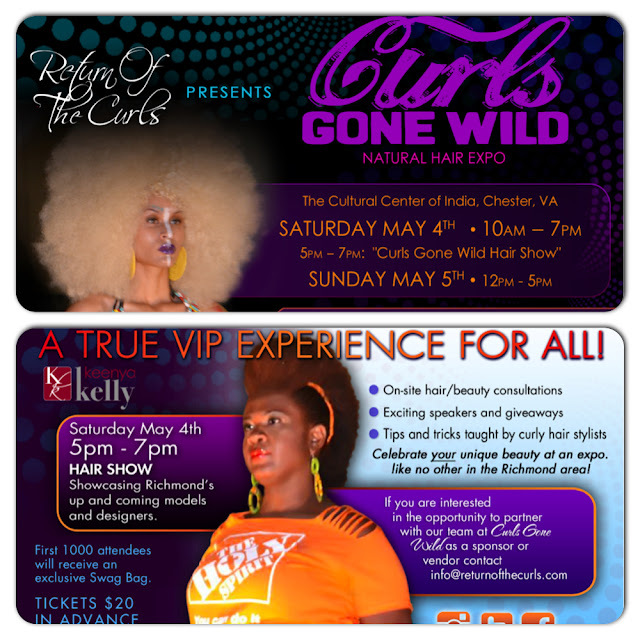 A Richmond-based business established in 2012, Return of the Curls’ events are widely becoming known as the premier experience for consumers to receive information and products related to health, beauty and fashion. Sounds awesome, right? Well, YOU can a ticket to the tour! 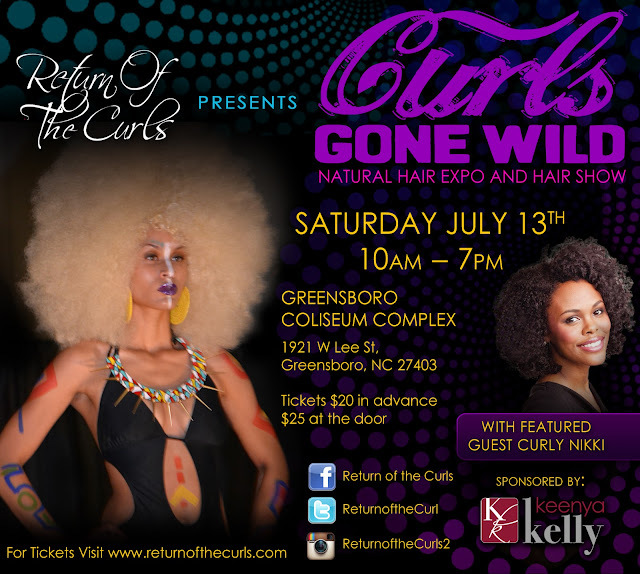 The Curls Gone Wild Tour is coming to Richmond, VA on May 4th and Greensboro, NC on July 13. To read more about the tour, click here. You must be able to attend the event. For Richmond, you must be able to attend on May 4; for Greensboro, you must be able to attend on July 13. Please ensure you are available to attend before entering the contest. If for some reason you are chosen, but find out later that you are unable to attend, please notify me as soon as possible. If you are able to give the ticket to someone else, please provide that person’s name and email so that we can update the ticket information. If you are not able to find someone, I will choose another random winner. Giveaway is open March 25 until midnight, April 1. Please remember to read my Giveaway Disclaimer. Greensboro, NC July 13 - I'm looking forward to going, with my free ticket! Hoping to win a tix to the Greensboro show!!! I would attend the Greensboro show!